as a beauty lover, i basically have my stuff all over my apartment but i still forget to use some of them. these are the ones i keep right next to my bed and use at night right before i go to sleep and i would say a lot of people keep such products right next to their bed. for me they are three essentials to complete my skin and body care routine but i will only remember them if they are right next to me. first off all, an eye cream. i only started using eye creams about a year ago and for some reason i always forget it. i don’t feel like i have any problems with aging around my eyes just yet but my under eye area tends to be quite dry as all of my skin. to avoid that i use the kiehls creamy eye treatment with avocado. it has a very weird green color but once i rub it in between my fingers to pat it under my eyes its just so soothing and lovely and it keeps my eye area hydrated at any time. i also am a pro when it comes to forgetting to use some sort of lip balm and as you know i love rocking lipsticks so good looking lips are a must. 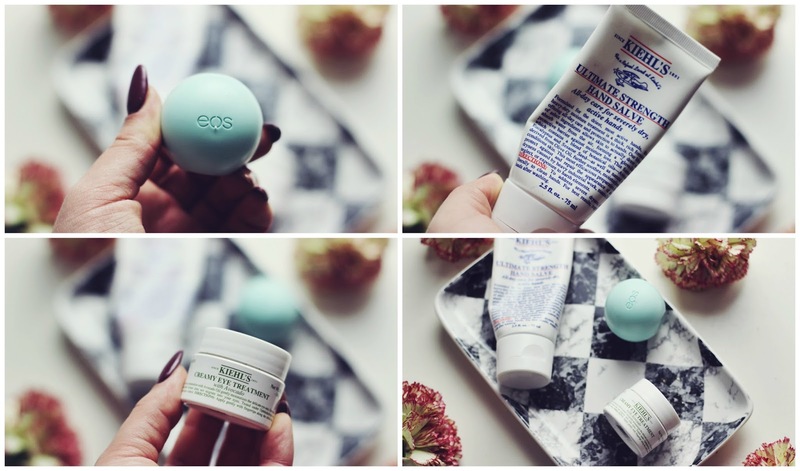 lately i’ve been loving the eos lip balms. i find them to be very moisturizing on the lips and i don’t actually have to stick my finger into a pod, a huge plus for me. last but not least is hand cream. my hands get super dry and the only hand cream that works for me is also one by kiehls. its their ultimate strength hand salve. a very thick hand cream that still sinks in quite quickly and makes my hands feel baby soft. its the best one i ever tried and my boyfriend happily uses it too. so here are my bedside beauty essentials. let me know if you tried any of these and what your essentials are. i’d love to know.